Featured! Maple And Oak Designs Home | About Us | Opportunities | Sponsorships | Contact Us! This week on Handmade Men we had the privilege of chatting with Guillaume and Leonie from Maple and Oak Designs. This is the perfect time of year to procure handmade scarves, and these amazing artisans have created a full array of designs that will make any man stand out and look great. From traditional scarf styles with a twist to infinity and hood scarves, you’ll find something perfect for winter right here! Welcome Guillaume and Leonie! Thank you so much for taking time to share with us! We are Maple and Oak Designs. We specialize in accessories and home decor for men and women, and all of our designs are one of a kind. We like to make one of kind items because they are so special – and our customers can be proud and say that they’re the only ones in the whole wide world who have exactly this scarf or headband. Your work is amazing, and it shows that you take inspiration from a variety of places – and maybe even places from across the world. What got you started in creating, and eventually developing the Maple and Oak Designs brand? 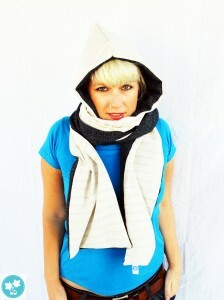 Leonie started to sew reversible hooded scarves last autumn. They were meant to be Christmas presents for her friends and family. When a friend visited and we showed him the scarves, he was so intrigued with the idea that he talked me into selling him one for his wife. Just a few days later another friend had a look at Leonie’s creations and she asked me if she could make a hood scarf for her as a Christmas present for her little sister. That was the first time we had the idea to open an Etsy shop. After a couple of months being on Etsy, we realized that there weren’t a lot of scarves for men. 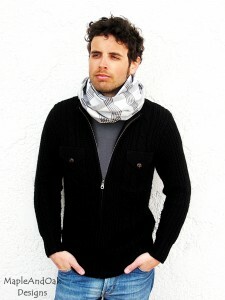 So we started making scarves especially for men. And we’re glad you did! It can be hard to find the wide selection of designs and styles for men that your shop offers, so we’re glad your work is out there! 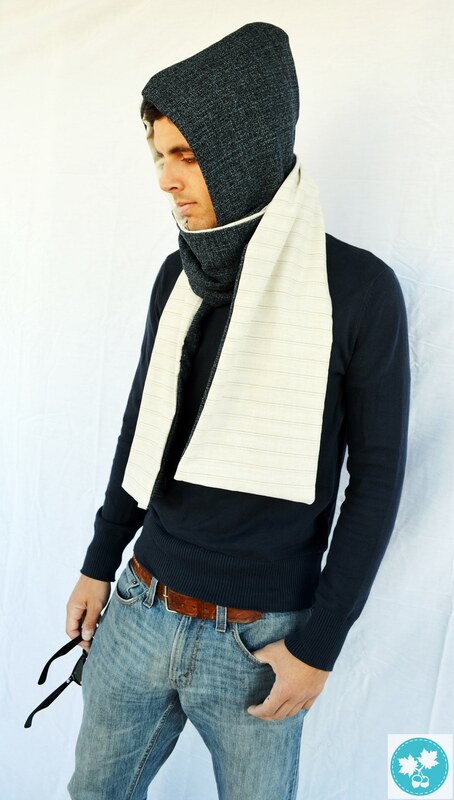 When we first thought about scarves for men, the picture of a really boring beige camel hair scarf would pop up in our mind. We wanted to change that. There are not a lot of men who would be willing to wear bright pink scarves with little hearts. 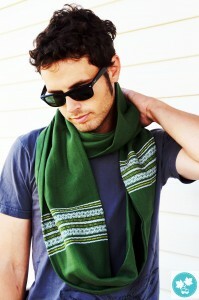 Still men’s scarves don’t have to be boring; you can make them interesting just by the pattern. For example, our hood scarves for men are made from fairly plain or traditional fabrics (at least compared to our women’s line) but the hood gives them the certain je ne sais quoi that makes them different. The same can be said for our infinity scarves. Infinity scarves are really fashionable, but why should only women have the right to wear them? 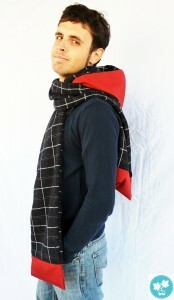 So we chose some nice checkered or striped fabrics paired them with plain fabrics and made interesting circle scarves for men. We’re fans of all those designs! As artisans and handmade enthusiasts yourself, why do you think it’s important for people to support handmade and choose one of a kind pieces for themselves and as gifts? We believe it is important to support businesses that sell handmade items. The world would be so much better if everybody would just buy handmade. Not only when you think about the people working for less than minimal wages overseas, but also if you think about the people here. Lots of people enjoy making things with their hands and would be a lot happier doing that than working in their little cubicle office every day. You’d be surrounded only by beautiful things – wouldn’t that be amazing? Everything handmade is often more expensive but therefore it also lasts longer and do you really need 10 scarves instead of 2 beautiful ones? Every handmade item you buy has its own story. Lots of random people, for example on the train, started talking to us about the handmade clothes that we were wearing – a wonderful way of meeting new women (or men if you prefer)! Since we’re coming upon the gift giving season, why do you think gift buyers should look at handmade when selecting presents for their loved ones? 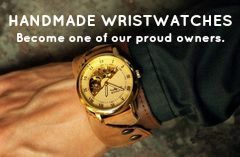 Handmade is unique and has a story to tell. What better gift than the one with a story? From a merely pragmatic point of view, a handmade gift is always better quality than one made in a factory. It will last longer and make you happier. Any plans or upcoming events? You will find us at a couple of winter and Christmas markets in Calgary this winter. There’s the Elbow Springs Winter Market on the 3rd and 4th of November 2012, the Market Collective on the 1st and 2nd of December 2012 and What the Craft Calgary! on the 8th of December 2012. So at the moment we’re mainly concerned with stocking up for those events and the hopefully busy Christmas season. Make sure to check our Etsy shop regularly as we’ll be listing new scarves and headbands for men constantly! Also like us on Facebook – we might have special sales going on just before Christmas! January will be the month when we’ll focus on developing and creating new designs. We have lots of ideas for new items, though – how about arm warmers for men? We’ll leave that question to the comments area below and see what our readers think! Thanks again for sharing with us Guillaume and Leonie! Use the links below to connect with Maple and Oak Designs online right now! Tagged etsy, Featured, Handmade Men's Scarves, interview, Maple And Oak Designs. Bookmark the permalink.